This Universal Audio audio interface looks like a basic entry-level mobile (or leave it in the studio) interface with pro quality audio conversion and a couple of cool features. I love that it’s bus-powered because I hate hauling and plugging-in extra power packs, especially if I’m using my laptop outside of the studio. It has a single UAD processor – enough to run the bundled low-latency UA 610-B Tube Unison preamp and Marshall Plexi guitar amp plus the other basic bundled plugin essentials. It will, of course, be able to run any of the other UAD-2 plugins as well, but having only a single processing chip (they call it a UAD-2 SOLO Core processor) is a wee bit of a limitation in this regard. With some care and by removing any Unison preamp/amp plugins when they’re not being used, you could still enough power to run some other UAD plugins for mixing or mastering. The hardware is quite minimal – only two combo (XLR or 1/4″ Jack) inputs and two 1/4″ jack outputs on the back – plus an instrument in (1/4″Jack) and headphone out on the front. Just the essentials really. On the top is a display, eight buttons and a knob to access the input and monitoring features. 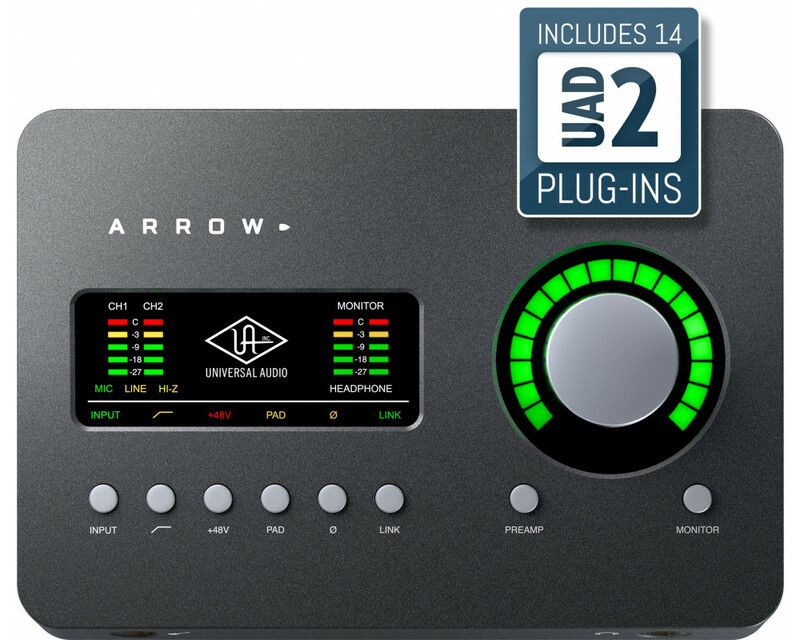 At around $499 USD ($899 NZD at the Rockshop in New Zealand) it’s a great deal for a Thunderbolt 3 bus-powered interface with included Unison preamps and some UAD plugin hosting functionality.